Can IoT reduce energy costs for retailers? This Is the third and final installment of a series of posts discussing promising use cases in retail and the benefits of adopting IoT technologies in 2019. What will be the ground-breaking new application of IoT and analytics that drives an epiphany and spurs widespread adoption? In previous posts, I discussed real-time customer experience optimization and supply chain transparency. A third and perhaps less flashy use case, cold chain management for grocery stores, was mentioned in the recent RSR Research IoT Benchmark study. 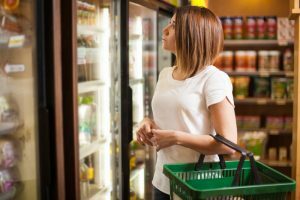 The study discusses how IoT can be used to improve energy consumption in grocery stores, and especially in the frozen food aisles. While energy efficiency might seem like a given for most retailers, there's actually a lot of opportunity for cost reductions using IoT. After labor costs, the highest operating expense in most large retail organizations is energy. Grocery stores are particularly energy and equipment intensive. Next time you're in your local supermarket, note the amount of space and equipment devoted to dairy, frozen food, meat and seafood, deli, bakery, and produce – not to mention HVAC. The cost of energy and maintenance is impressive. Supermarkets are the most electricity intensive type of commercial (non-manufacturing) building. On average, approximately 30 percent of energy utilized in commercial buildings is the result of waste. Average annual energy costs are more than $4 per square foot (U.S.). Every $1 in energy savings is equivalent to $59 in increased sales. Consider, if the average energy expense for a 50,000-square-foot grocery store is US$200,000 a year, then a 50 percent improvement enabled by IoT asset performance and energy management analytics could yield $3 million in annual savings for a 100-store chain. This explains why nine out of ten retail winners associate “a lot of value” for IoT in improving store operations. A cold chain is a temperature-controlled supply chain. An unbroken cold chain is an uninterrupted series of production, storage and distribution activities that maintain a desired low-temperature range. Optimizing and maintaining visibility into a cold chain requires logistics and energy management insight. IoT can offer a rapid return on investment by monitoring multiple nodes of the supply chain. Employing edge analytics on streaming cold chain data allows for predictive and prescriptive insights that reduce spoilage, improve asset performance and creates greater energy efficiency. It’s time for retailers to rethink energy and asset performance management. Analytics-based asset performance management, when properly deployed for predictive maintenance helps reduce asset wear and tear, energy waste, and perishable losses. But that's not all. The same IoT infrastructure investment can also enable cold case management for better food safety, Dynamic Shelf-Life Analysis paired with Dynamic Pricing algorithms to allow timely promotion of soon expiring merchandise, and many more cost saving and revenue enhancing capabilities. Retail Winners like Kroger, Walmart, Target and others are leading the industry with maturing IoT-enabled applications. Drop me a comment and let me know if you have enjoyed this IoT “use-case” series. As we move into 2019 I look forward to reporting back to you on whether retailers are demonstrating an intuitive grasp on IoT’s benefits to their bottom lines.